Many Americans spend time in Seoul with the U.S. military or on business. 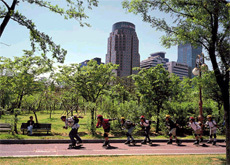 Only now is Seoul beginning to realize its potential as a draw for tourists as well. For those making their first trip to Asia — this is the place to begin exploring the other side of the world. The city is clean and free of street crime; people have little need to worry about terrorists blowing up buildings full of people; and there is no SARS. In one week, a writer and a photographer saw no face masks worn anywhere in the city, and that includes crowded markets, restaurants and entertainment districts that teem with people day and night. Seoul, like the rest of Northeast Asia, is off the beaten path for the militant Islamists. Of course, the ever-hostile North Korea lies just 30 miles to the north of Seoul, the sprawling capital of 20-plus million residents and commuters that offers living proof that South Korea won the Cold War. To appreciate how lopsided that victory was, the first-time visitor must join the 150,000 or so tourists who visit the demilitarized zone each year. Tours in English are readily available to several sites, including a peace park, mountain overlook and North Korean infiltration tunnels big enough for a two-lane highway. A visit to the truce village at Panmunjom tops them all. It isn't much of a village, just a bunch of simple one-story huts, scrubbed and freshly painted in the shade of baby blue that matches that of the U.N. flag. They sit in a tiny valley surrounded by guard towers and observation posts manned on the other side by real North Korean soldiers. In crisp, pressed olive uniforms, with pictures of North Korean leader Kim Jong-il on the lapel, they stare at visitors with furrowed brows, snarled lips and scowling eyes. 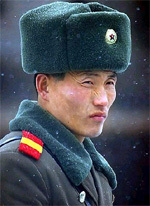 When the guide takes visitors into one of the huts, sometimes a North Korean soldier will stroll up to the window and glare inside. 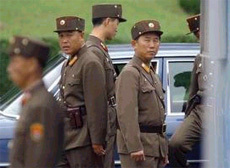 Try taking a picture of the North Korean, but be quick. As soon as he sees a camera pointed in his direction, he runs away. The tours are well-organized. Tennis shoes, bluejeans, shorts and other casual wear are forbidden, lest they provide images for North Korea's propaganda machine to illustrate America's decadence. The tours come with a briefing from an American soldier, and there are plenty of opportunities to peer at North Korean guard posts atop rolling hills outside. There's a fake North Korean village, dubbed "propaganda village" by U.S. and South Korean troops. No one lives there, but sometimes the North Koreans bring in a busload of people to hang up some laundry and otherwise hang out to fool the VIPs they bring down from Pyongyang. DMZ separates North from South. A loudspeaker above the village blasts insults at the South, or classic communist propaganda. "Our great leader Kim Jong-il has done so much for us," it blared during a recent morning visit as pairs of white Manchurian cranes frolicked overhead. The species is said to be extinct everywhere except along the 150-mile-long, 2.5-mile-wide demilitarized zone that divides the peninsula. No one walks through the DMZ except wildlife, except at Panmunjom — until recently the only land crossing between North and South Korea along the entire length of the DMZ. Here, huge letters decorate mountain slopes facing south. "Our victory is for our sunshine general, Kim Jong-il, hurray," says one mountain. Each boasts a giant flag on a skyscraper-size flagpole. North and South used to compete, building bigger and bigger poles and flags until, presumably, the South decided things had gotten out of hand. The North won that battle and today displays the biggest flag on the tallest pole. The problem is that the flag weighs more than 600 pounds, meaning it just hangs like a wet dishrag unless a typhoon happens to blow through. On the other side, the South Korean flag unfurls in the gentle morning breeze. Panmunjom has a history of ax murders, defections and shootouts, but the last serious incident was 20 years ago when a defection by a Soviet officer, who stepped across the line, triggered a firefight. One can leave for Panmunjom early in the morning on a tour bus from Seoul and be back with plenty of time to spare in the afternoon. The experience is guaranteed to be so grim that Seoul will feel like paradise, and that's a good way to begin exploring. Five royal palaces ring downtown Seoul, each undergoing a massive restoration amid a nationwide renaissance of appreciation for the country's ancient history. The walled compounds, with towering wooden gates and curved tiled tops, defined the city a century ago, when kings ruled and the aristocracy lived in gilded splendor. 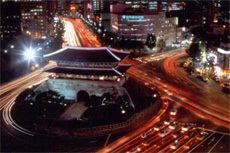 At night, Seoul provides the cosmopolitan flare of dining, theater and nightclubs. There's also a futuristic side of Seoul. Check out the area around World Cup Stadium containing a power plant between two giant man-made mountain mesas — both former garbage dumps. Atop one dump sits an 18-hole golf course, and atop the other is a public park. The green is so lush it's hard to believe garbage lies underneath, and this is where the power plant comes in. The plant makes electricity by burning off the extracts from pipes deep underground. It supplies power to the adjacent World Cup soccer stadium, which is being converted into an upscale retail mall with luxury high-rise condos nearby. 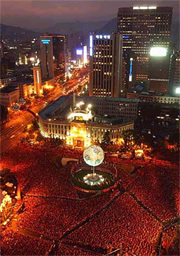 Nearly 1 million South Koreans gathered in downtown Seoul in a 2002 Wold Cup frenzy. The 2002 World Cup — in which South Korea became the first team from Asia to make the final four — inspired the Seoul metropolitan government to begin an aggressive campaign to lure Western travelers. The campaign, with the slogan "Hi Seoul," focuses on the past, the present and, as with the reclaimed garbage dump, the future. Seoul City Hall, an imposing gray building from pre-World War II days when Japan ruled Korea as a colony, is a good place to start. Inside the front door, the tourist can pick up information on just about everything there is to do — written in English. A good subway guide and several maps are available, including one that shows the location of every public, self-sanitizing toilet in Seoul. The toilets are like giant portable commodes except that the entire interior gets sprayed with disinfectant after each customer. Look for the yellow pamphlet titled Foreigner's Favorite 10 Best Korean Foods. The brochure has color photos of all the delicacies so one can carry it into any restaurant and simply point to the picture. Topping the list is bulgogi, a sweet beef barbecue, and somewhere in the middle is kimchi, the fiery dish of pickled cabbage, cayenne pepper and garlic, which is served with every Korean meal. Other favorites include galbi, in which meat from prime beef ribs is grilled over charcoal, and samgyetang, a chicken dish without the hot spices. There also is a sushilike dish called gimbab, and Korean-style dumplings known as mandu. Namdaemun, National Treasure No. 1. Though Seoul sprawls in all directions, its ancient palaces and teeming markets lie within a tight circle just several miles wide, which framed the city as it existed at the turn of the 20th century. Back then, a king ruled and royalty lived in splendor. Confucian scholars had special digs reflecting their high status. A wall enclosed the circle, with gates to the north, east, south and west, connecting Seoul to the outside world. The recently opened Seoul History Museum gives one a feel for old Seoul. It features scenes from the old city with a mix of scale models and computer graphics. Royalty moved about on litters carried by servants, merchants plied their trade in bright silk robes, and commoners in rags toiled with rickshaws on the dusty streets, hauling the day's catch from the nearby Han River through the city gates to market stalls. In visiting the museum, be sure to sign up for the English-language tour. Seoul is world-famous for its shopping. For Westerners, the Itaewon district offers one advantage in that most shopkeepers speak English. By day, Itaewon is a shopping district featuring the typical fare of leather goods, handbags, luggage, souvenirs and casual Western-style clothing. Tailors will make shirts for about $20 and suits in the $300 range. At night, Itaewon's bars, clubs and restaurants take over with a largely foreign clientele. It features live music — jazz and blues — on weekends. Though one can still find traces of red-light sleaze, the neighborhood largely has moved beyond its tawdry image to become an international shopping and wining and dining district. For a relaxing dinner there, try Gecko's Garden, which offers a multilevel bar and restaurant in a converted villa, with a wide range of beers and wines served on outdoor terraces that make it popular with expatriates and visitors. Myongdong was perhaps the city's first modern shopping district. Today, it is largely pedestrianized, wall-to-wall with cafes, restaurants, small boutiques, mid- and high-end department stores, restaurants and karaoke rooms. Just five minutes away on foot lies the restored South Gate of the old city wall, and across the street, bartering between merchants and customers continues at Namdaemun or South Gate Market as it has for the past 500 years. It is one of Asia's largest open-air markets, a place where one can lose oneself for hours. A good time to visit is in the afternoon, when the main retail buyers arrive, or in the early morning hours, when the wholesale customers appear. Insadong is Seoul's artsy shopping district, known for pottery, Buddhist paraphernalia such as clothing, prayer beads and statuary, paper craft such as fans and screens, and calligraphic sets. It also has many furniture shops specializing in antique or high-quality reproductions of antique chests, desks and cabinets. The area is pedestrian-only on Sundays, with street stalls and performers. 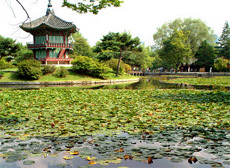 It also has many good traditional restaurants, one of the most popular being Sancheon, a Buddhist restaurant. Located at the end of a narrow ally, it features authentic Korean Buddhist cuisine. The menu is based on mountain vegetables, a legacy of the time when Korean Buddhists were driven from the city by Confucian rulers during the Chosun dynasty (1392-1910). Buddhist cuisine, while lacking the fire and spice of typical Korean fare, did exert its influence on modern Korea's use of many vegetable and bean-curd dishes. 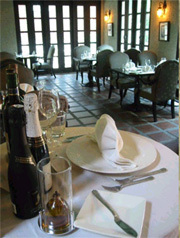 The restaurant, opened by a former Buddhist monk, also offers traditional music and dance performances in the evenings. From downtown, one can take a chairlift to the top of Namsan Mountain, which rises 1,500 feet from the middle of the city. 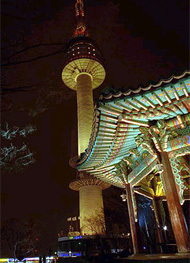 On top, Seoul Tower's observation deck, soaring high above the city's skyscrapers, includes displays to help visitors pick out spots along the old walled circle and view most of the shopping areas just described. On the northern edge of downtown lies Kyongbok (also spelled Gyeongbok) Palace, nestled on the south-facing slope of another mountain. When restoration work is complete, the palace, with its long approach through three massive gates on a path leading up from the city streets, undoubtedly will rival Beijing's Forbidden City. 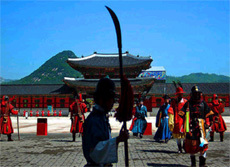 Only recently did South Korea begin to rediscover its past. Until the nation achieved First World living standards and put away military rule — something that didn't happen until the late 1980s — reflecting on its recent history was just too painful. Nearly 40 years of Japanese colonial rule evoked a sense of shame. 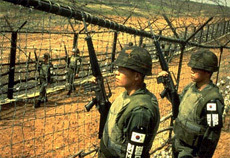 Then, just a few years after Korea won its freedom, the Korean War left the country in ruins. The restoration work being done on Seoul's palaces reflects a newfound pride in the past, an appreciation of an ancient culture and a desire to show it to the outside world. "The biggest charm of Seoul is that there are lots of beautiful tourist sites that are in tune with tradition and modernism," says Cho Sang-meyong, manager of the Seoul Metropolitan Government's tourism promotion division. Seoul is full of four- and five- star hotels, including two from the Intercontinental chain, a Marriott, Shilla, Hilton and Lotte. At the Hyatt, with its panoramic view of the Han River, one can mix at the health club with captains of industry and future presidential candidates. Lately, a number of lower-priced guesthouses are becoming popular, especially with younger tourists. The Seoul Guest House is one of a number of small, family-run facilities in the old, quiet district of Anguk Dong. Rooms built around a quiet courtyard in the style of old Korean houses go for about $30 a night. One sleeps on a mattress on the floor, and a common room provides a computer with a high-speed Internet link. A few blocks away lies another of Seoul's palaces, Changdeok, the only one to survive burning by the Japanese in a late 16th-century invasion. Though the architecture is not as spectacular as at Kyongbok Palace and it lacks the exhibits of another palace, Deoksu with, its museum, the peace and quiet in the wooded landscape gives a sense of what much of Seoul must have been like in ancient times. 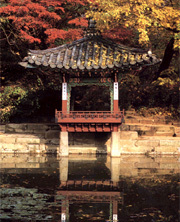 Changdeok Palace boasts the Royal Secret Garden, or Biwan, one of Seoul's best-preserved palace gardens. Here, one must sign up in advance to be part of a tour, with excursions in English offered daily except Tuesdays. The Royal Changing of the Guard is re-enacted at 2 p.m. daily at several palaces throughout the city. Guksadang, the national shaman shrine, sits atop a mountain with the ancient Spirit Tree outside. It is set on the slopes of Mount Inwhang, a site of great geomagnetic power. On the way up the mountain is a village with 16 Buddhist temples. This is not a tourist site yet, although it is a quick taxi ride from central Seoul. In the evening, one can find shamans praying at the Womb of the Earth Mother, a spring near the mountaintop. Shamans also perform rituals near an unusual rock formation, known as Son Bawui, or Zen Rocks, which resembles praying monks. A bit outside of central Seoul, Samcheonggak, a former Kisaeng or Korean-style geisha house, was once reserved for high-ranking Korean government officials. Now it houses a restaurant, teahouse, guesthouse and performance area open to the public. The traditional-style building complex lies on a wooded hillside in Seoul's most exclusive old-money district. Food in the restaurant Asadal is expensive, but it is authentic Hanjeongsik, or traditional Korean food: a mix of royal court, aristocratic and Buddhist cuisines. For nightlife, try Samcheong Dong, a funky pub with live music in this otherwise quiet area near Samcheonggak. After a couple of drinks, it is worth walking down through the quiet, tree-lined Samcheong Dong district, which is full of old houses, restaurants, galleries, small bars and cafes. Yeoiudo Park in the center of the financial district on Yeouido island. Consider that the park was built over what once was an airstrip designed to evacuate lawmakers from the nearby National Assembly in the event of a North Korean invasion. The Noryangjin Wholesale Fisheries Market features many blue-collar restaurants selling some of the freshest and cheapest hoe (pronounced "hway"), which is raw fish, or sashimi, anywhere. Figure on spending about $25 a person for a night of eating and drinking. One also can buy live fish from the market and have a restaurant prepare it for dinner. For entertainment, "Nanta," a musical featuring crazy rhythms and known by the name "Cookin' in the West," has gained glowing reviews abroad. Despite the modernity of the concept, there is a lot of traditional Korean involved: percussive rhythms, martial arts and plenty of slapstick humor on bosses and bums. It keeps the audience in stitches, and there is no language barrier. One recent performance had a 3-year-old laughing along with the rest of the audience. The performance provides a good example of the loudness, dynamism and exuberance of Korean culture, which is not particularly known for subtlety. The plot is simple: The boss of a restaurant orders his three chefs to prepare a wedding banquet by 6 p.m., then foists his incompetent nephew on them as a fourth chief. The play constantly evolves, so it is worth seeing more than once. It is possible to meet the performers after the performance. "Nanta" has spawned a whole subgenre of plays, including "Goblin Storm," based on Korean folk legends; "Show Taekwon," based on taekwondo; and "UFO," based on aliens. For trendy foreign cuisine, try Wood and Brick. A Parisian-style cafe downstairs complements a converted loft upstairs that features Italian cuisine amid a gallery of modern art. Yongsan Electronics Market features block after block of computer and electronics stores. Bargains can be found, but one should have a product in mind and a good idea how much the item would cost at a discount store in the West. Dongdaemun market features so-called "bag traders" from as far away as Eastern Europe and Central Asia. The Gyeongdong Herbal Medicine Market is full of the sights and smells of Oriental medicine. The War Memorial of Korea museum, like the DMZ tours, adds a sobering touch to any visit. Outside are planes, tanks, guns — even a submarine. Inside are displays that range from exhibits of prehistoric weapons to a video war-game room. 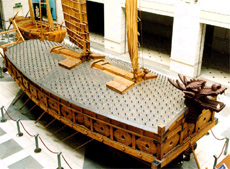 The 13,000-plus exhibits include a reconstruction of a Turtle Ship, the world's first ironclad warship, which was used by Adm. Yi Sun-shin to defeat Japanese naval forces in the 1590s. Other exhibits include a Korean War gallery and a Vietnam gallery. A statue outside represents a real incident, when a North Korean and a South Korean soldier — brothers — met by chance on the battlefield during the Korean War. The above story is from The Washington Times.